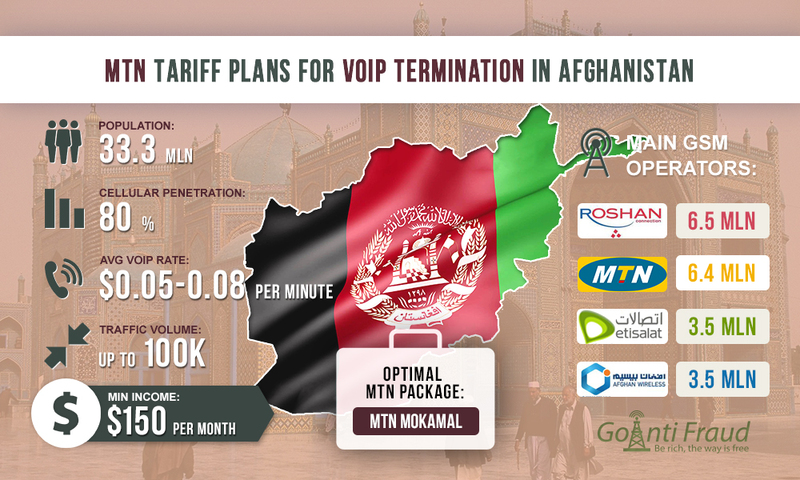 The telecommunications market in Afghanistan has experienced a recovery from years of war and civil unrest. To date, the country has a well-developed mobile communications sector. GSM covers 90% of the territory, while 80% of the population (out of 33.3 million) use the services of cellular operators. This opens up excellent opportunities to make money terminating international traffic. Before placing a primecell gsm gateway or other VoIP equipment in Afghanistan, you need to buy SIM-cards of a major operator. MTN packages are very popular. The subscriber base of this cellular company has more than 6.4 million users in Afghanistan. To make a profit, it is important to choose the most suitable tariff plan. MTN SALAM. The cost of the SIM-card is $1.12, while $0.75 is immediately transferred to the subscriber's account. On-net calls, as well as calls to other operators' numbers, are charged at $0.04 per minute. MTN ASHNA. For $1.12 you get 2 SIM-cards at once that have $0.37. It is advantageous to make calls only to numbers of subscribers with the same package. Calls to other numbers within the network are $0.04 per minute. BALAY. Calls within the network cost $0.03 per minute. To switch to this tariff plan, you must first buy the MTN SALAM package for $1.12, with a credit of $ 0.75). The transition to this tariff plan will be free in this case. MTN MOKAMAL. The cost of connection is $0.22 when switching from another tariff plan. You can immediately buy a SIM-card for $0.75 and get the same money to your account. The cost of calls within the network is $0.03 per minute. MTN AASAN PACKAGE. The price of the package is $0.75, and the same amount immediately goes to your balance. One minute of the call to any local numbers will cost $0.04. TALK MORE. All subscribers who use prepaid services can switch to this tariff plan. $0.03 will be withdrawn from the account on daily basis, and after the first minute, the conversation will be charged at $0.01 per minute. The optimal package for terminating traffic is MTN MOKAMAL. Using it, there will be no expenses for the purchase of SIM-cards since the money spent on their purchase immediately goes to your account. At the same time, a minute an on-net call costs $0.03. The average rate in Afghanistan is $ 0.065, so you can earn about $200 from each channel if you work 5 hours a day. For a stable income generation, it is important to protect SIM-cards from Antifraud systems. GoAntiFraud will help you to do so by providing efficient tools to simulate the behavior of a real GSM subscriber. Customers of the service also get the opportunity to automate work processes and remotely control VoIP equipment. At your disposal, there are training videos, goip 8 manual, the latest news from the world of GSM termination and other materials that will be useful for business.